proach affects how culture is dealt with in class and in teaching materials. of the perspectives in question. on the main trends within each perspective. their mother tongue, will abandon them, and so on and so forth. Learning then is a habit formation process. culture “in its normal undisturbed operation” (Lado, 1986: p.
ant conditioning tenets were found to be no longer tenable. learner may perceive and appreciate aspects of another culture. bicultural heavily depends on a multitude of affective factors. and communication between people are essential to liberation. understand one another’s meanings and intentions. between such movements (Melucci, 1989). and made invisible (Philips, 1983) in communicative curricula. by material designers and practitioners. derstanding of what is involved. Loveday (1981: p. 61). 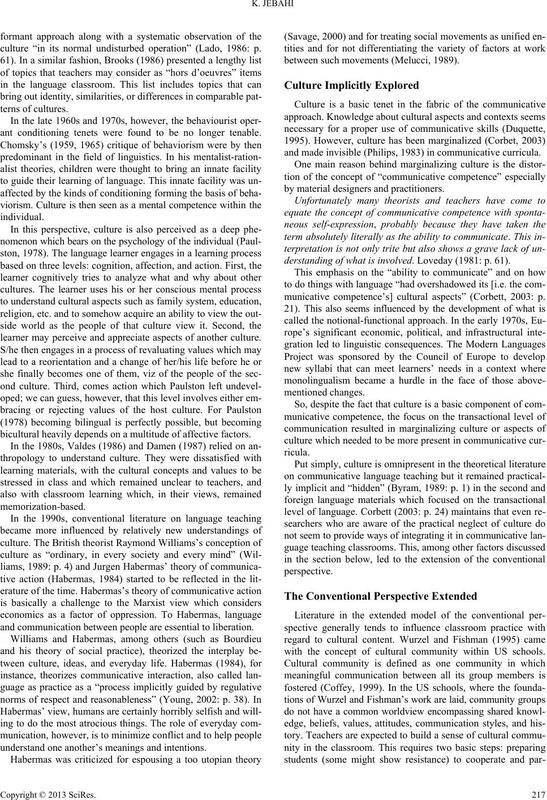 municative competence’s] cultural aspects” (Corbett, 2003: p.
with the concept of cultural community within US schools. revision of the conventional perspective. and problems arising within the conventional perspective. perspective, Atkinson (1999) espouses a revised view of culture. ence and are sensitive to new input from environment. dividuals are part of their social world. knowledge of culture which is always multiple and complex. unrealistic” (Alptekin, 2002: p. 57). comes to be valued as it is). sented as homogeneous, fixed, and consistent. steps which can guide teachers’ work. 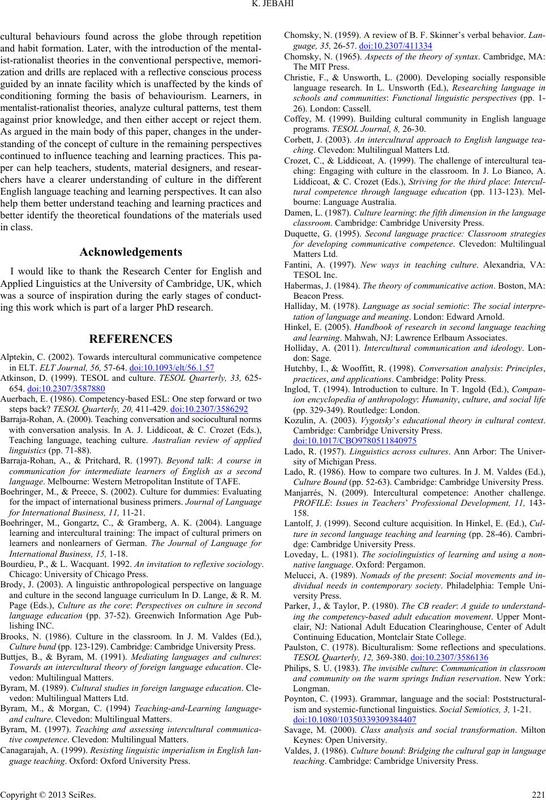 and native linguacultures” (p. 41). munities in periphery status” (p. 4). styles differ from those of the students. 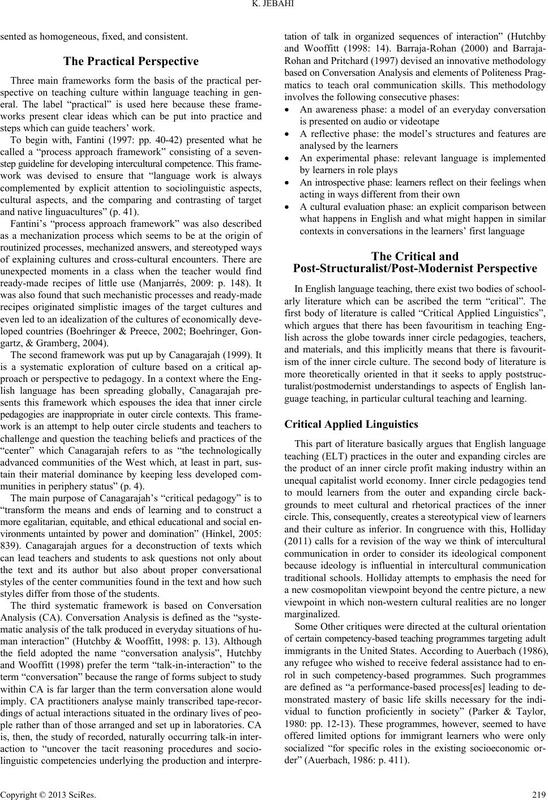 guage teaching, in particular cultural teaching and learning. 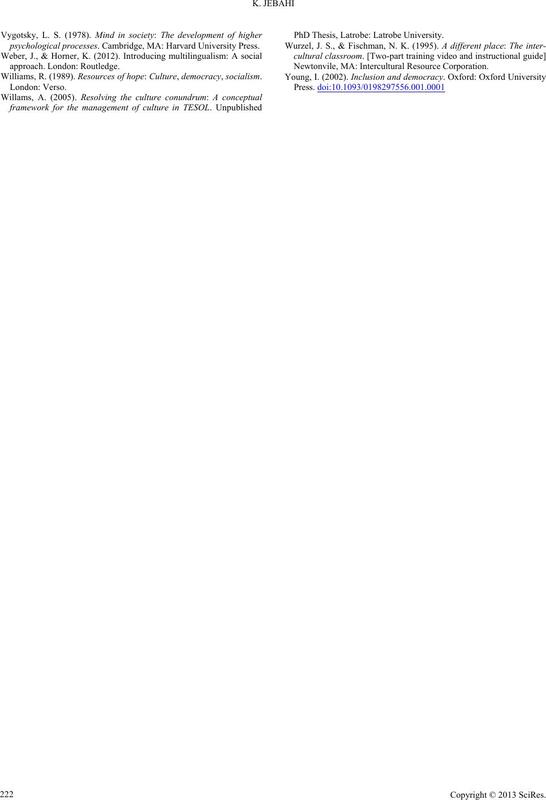 der” (Auerbach, 1986: p. 411). ture and unifying patterns are what makes this double truth. different affiliations to different social groups. tural rather than individual phenomena. an internal psychological plane (Lantolf, 1999). how culture is dealt with in class and in the teaching materials. change in views about culture in the perspectives in question. against prior knowledge, and then either accept or reject them. ing this work which is part of a larger PhD research. language. Melbourne: Western Metropolitan Institute of TAFE. for International Business, 11, 11-21. Bourdieu, P., & L. Wacquant. 1992. An invitation to reflexive sociology. and culture in the second language curriculum In D. Lange, & R. M.
Culture bund (pp. 123-129). Cambridge: Cambridge University Press. and culture. Clevedon: Multilingual Matters. tive competence. Clevedon: Multilingual Matters. guage teaching. Oxford: Oxford University Press. programs. 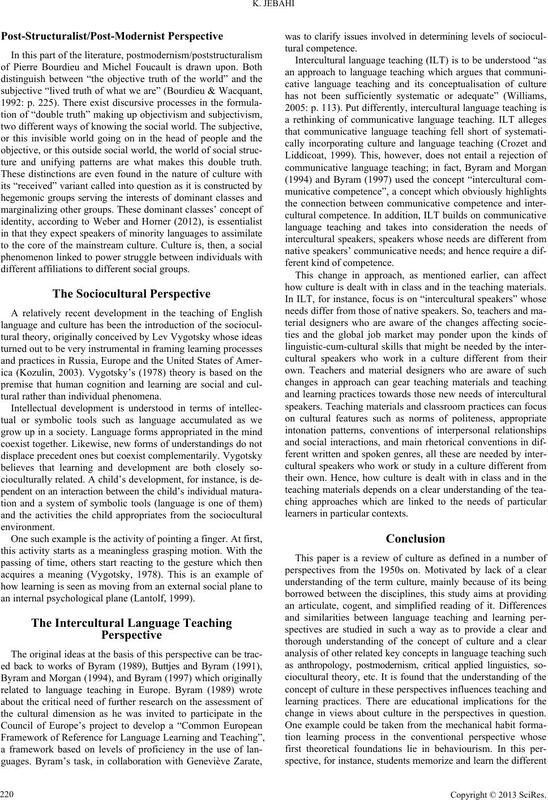 TESOL Journal, 8, 26-30.
ching. Clevedon: Multilingual Matters Ltd.
ching: Engaging with culture in the classroom. In J. Lo Bianco, A.
classroom. Cambridge: Cambridge University Press. tation of language and meaning. London: Edward Arnold. and learning. Mahwah, NJ: Lawrence Erlbaum Associates. practices, and applications. Cambridge: Polity Press. Kozulin, A. (2003). Vygotsky’s educational theory in cultural context. Culture Bound (pp. 52-63). Cambridge: Cambridge University Press. Manjarrés, N. (2009). Intercultural competence: Another challenge. Continuing Education, Montclair State College. Paulston, C. (1978). Biculturalism: Some reflections and speculations. 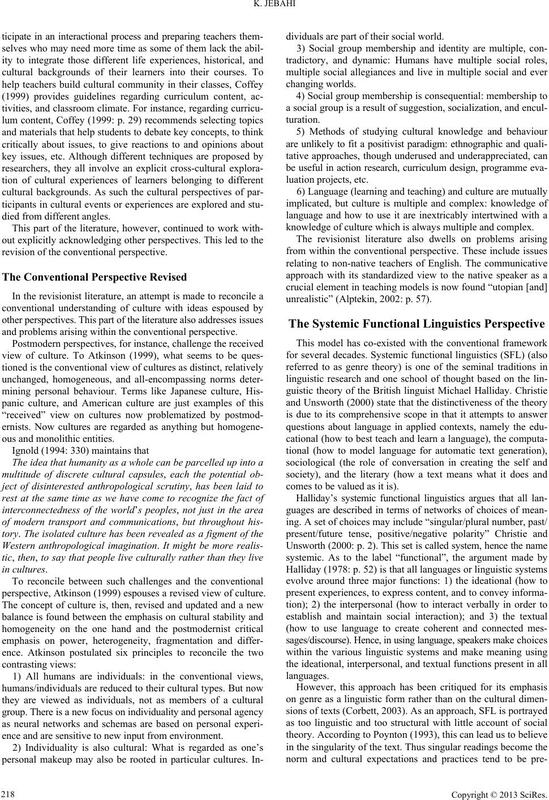 ism and systemic-functional linguistics. Social Semiotics, 3, 1-21. Williams, R. (1989). Resources of hope: Culture, democracy, socialism. PhD Thesis, Latrobe: Latrobe University. Newtonvile, MA: Intercultural Resource Corporation.